What will a world with 5G look like? Everyone in the wireless industry agrees that 5G is coming by the end of the decade. But what will it be used for? That's still up in the air. Nokia previewed a demonstration it plans to present at Mobile World Congress later this month, detailing its vision for 5G. Nokia's 5G forecast includes some surprising capabilities: 5G will make cars safer to drive. It will make instant replay more instant. And doctors will be able to perform surgery using wirelessly controlled robots. And, yes, 5G will be much faster. 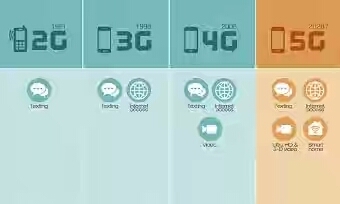 Still, the wireless industry thinks 5G will be really fast: 10 to 100 times faster than 4G. Those faster speeds will also allow more customers to be connected at the same time, giving the network more capacity and making connections more reliable for mobile customers. 5G's low latency should help tremendously to allow networked robots to perform even more complicated tasks in the future, Nokia predicts. When you put on a virtual reality mask, you can "enter" a virtual world with other people. You can interact with them, play video games with them, and even virtually high-five them. With 5G, Nokia believes virtual reality users will be able to collaborate as if they are in the same physical location. It could usher in a new era of video games and remote collaboration. 5G will give birth to the next phase of human possibilities, bringing about the automation of everything. This automation, driven by a smart, invisible network, will create new businesses, give rise to new services and, ultimately, free up more time for people.